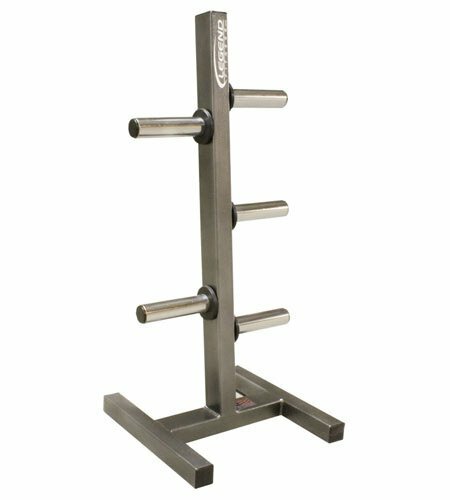 The Legend Fitness 3193 Olympic Peg Plate holder is Legend's beefiest commercial Olympic plate tree with five chrome Oympic-sized pegs, each spaced apart to accommodate smaller and larger weight plate diameters and increments. Compact vertical plate rack designed for heavy duty storage in health clubs, garage gyms, and sports performance training centers. Everything is welded and contained within a space-conscious 18 x 18 inch footprint. Since 1977, Legend Fitness has been committed to providing quality manufactured fitness equipment that is heavy-duty and proudly Made In The USA. Legend Fitness Equipment is made with big steel and perfect for schools, commercial gyms, military bases or anywhere that quality and safety cannot be compromised. Weight plates are NOT Included (shown in image for demonstration purposes only). Weight plates NOT included. Designed to hold Olympic plates (2" hole). Five 8-inch chrome Olympic-sized weight pegs with rubber bumpers where peg meets frame. Unit dimensions: 18" L x 18" W x 42.25" H. Unit Weight 42 lbs. Shipping Weight 47 lbs.